Edouard Cortès was born into a family of painters. His grandfather, Andrés Cortès (1800-1861) was an “academician of the Holy Isabel of Sevilla (sic), dignified with several crosses of distinction, founding member of the Diputacion archaeological of Sevilla.” [i] His paintings were shown at the annual Exhibition of Arts in Seville where he won a silver medal in 1858. Andrés’ son Antonio (1827-1908) likewise became a painter, initially at the royal court of Spain, and then in France. At the age of thirty-two, Antonio set his sights on Paris where he began to exhibit his work at the Salon of 1859. He returned briefly to Seville when his father died in 1861, but by 1863, he was living in the Batignolles quarter of Paris at 4 rue des Dames with a studio a few blocks away at 90 rue de Clichy. 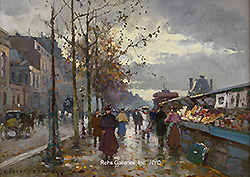 In the 1860s, the neighborhood was home to a lively arts community including the so-called Batignolles group that gathered around Edouard Manet. 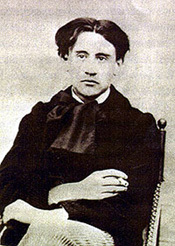 Antonio’s stay in Paris lasted only until 1866 when he married Angélique Berger, a young widow, on September 13. The couple moved about fifteen miles east of Paris to Lagny-Thorigny on the Marne river where the Cortès family would settle; their son, André George Charles Fernand Cortès y Aguilar, was born there on December 20, 1866. The next five years seem to have been both prosperous and pleasant. Antonio continued to exhibit at the annual Salon and established a reputation as a painter of rural landscapes. In the midst of the turmoil surrounding the Franco-Prussian War, Angélique died unexpectedly on January 5, 1871 at age thirty-three, leaving behind her five-year old son. Antonio remarried twenty months later on August 22, 1872; his new bride was the twenty-two-year-old Léontine-Augustine Frappart, a dressmaker. The family continued to live in Lagny where Léontine gave birth to a daughter, Jeanne-Marie in 1874. Antonio’s career was thriving and his son André began studying painting with his father in approximately 1880. It was not until 1882 that the youngest of the Cortès children made his appearance; Edouard-Léon Henri was born at home at 3 rue des Etuves in Lagny on August 6th. Edouard, who seems to have been called Henri as a child, started school in 1888 and earned his Elementary School certificate in 1895 at age thirteen. At that time, he too began to study painting in his father’s studio. Both his brother and sister had gotten married in 1893 and begun their own families, so Edouard was the only child still at home. Like his father before him, André had made his Salon debut—in 1886—and was pursuing a successful career as a landscape painter. [ii] Sadly, André’s future was cut short in 1898, when he died at age thirty-one; his four-year-old daughter Lucie died four months later in September. Shortly after the close of the 1899 Paris Salon exhibition, Marie-Edmond Höner (1830-1900), a painter and lithographer based in Lagny, decided to create a local artistic society; to that end, he founded the Union Artistique et Littéraraire du Canton de Lagny with the goal of establishing a regional exhibition program. This organization would prove to be an important forum for Cortès throughout his life, both as a gathering place for visual artists and as an exhibition venue in Lagny. Le Labour was included in the first exhibition, which opened on August 27 in the courtyard of a local school. The following year, Cortès submitted five paintings to the second exhibition. Over the next few years, the young painter continued to study with his father, living with his parents in Lagny, and sending several paintings each year for consideration by the Salon jury. His work was included in the annual exhibition in 1901, 1902 and 1903. Because of his father’s advanced age and Edouard’s status as the only remaining son of the family, he was exempted from French military service. This meant that Cortès was not exposed to French colonial life, as was typical for young soldiers, but it did facilitate his exploration of the French countryside instead. After participating in the Salon in 1905, the painter embarked on an extended stay with his sister Jeanne and her family in Le Tréport, Normandy, where he encountered a landscape that would become a recurring theme in his painting. 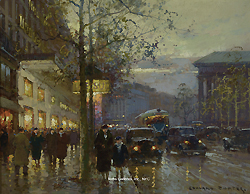 In 1906, Cortès exhibited a painting of Le Boulevard de la Madeleine, soir d’automne, an early example of what would become his signature image of a Paris streetscape; he chose the same type of image the next Salon as well, submitting Soir de neige près du square Montholon. By 1907, he was confident enough of his painting to organize an auction of his own works at the Hôtel Drouot in April 1907; he earned 250ff. 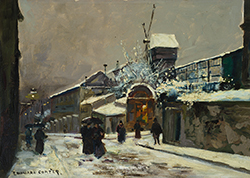 Having achieved a certain success as a painter, Cortès began to broaden his scope, exhibiting his work throughout France in a number of regional salons beginning with the Toulouse International Industrial Salon in 1908; he received a third class medal for La Port de Pantin, soir de neige. In addition, he joined a professional organization that year, the Association Amicale des Paysagistes Français (Association of French Landscape Painters) under the leadership of Henri Harpignies. The year brought sorrow as well, with the death of his father Antonio at the age of eighty-one. As the only remaining support of his mother, Cortès seems to have focused ever more intensely on establishing a prosperous career. He continued to display his paintings, and occasionally pastels, at the Paris Salon and to explore other opportunities for exhibitions. Increasingly, his work drew critical attention from the press; in 1910, his Salon painting received coverage in seventeen articles in a variety of publications. He was also able to purchase property at 22 rue Macheret in Lagny as a home for himself and his mother, although they spent the summer of 1910 with his sister Jeanne and her daughters in Loquirec, Brittany. In the following years, Cortès established a pattern of exhibitions throughout the country. To use 1911 as an example, he exhibited at the annual Paris Salon in April, followed by a show at the Union Artistique des Ardennes in June; the Société des Amis des Arts de l’Avallonnais in August; the Société Artistique de Charenton in September; and the Société des Artists Girondins at the Autumn Salon in Bordeaux in October. Although the locations of the regional exhibitions varied from year to year, this pattern set the rhythm for Cortès’ career for many years. In 1913, Cortès again spent part of the summer Loquirec, Brittany and had the good fortune to “develop an affectionate relationship with Fernande Joyeuse.” [vi] On December 10, 1914, they were married in Paris. Their honeymoon was short-lived however, as Cortés soon enlisted in the Army to fight the Central Powers (Germany, Austria-Hungary, Bulgaria and the Ottoman Empire). His drawing skills meant that he often moved from one regiment to another in order to visually record military information. Fortunately, he also created postcards of military life that he mailed home to Fernande. These images of the countryside and the soldiers, sometimes in the trenches, have the immediacy of a reporter’s observations at the front. Back in Paris, Fernande opened a millinery shop at 35 rue Piat in the 20th arrondissement and worked with her sister Lucienne to support the family. On March 24, 1916, she gave birth to a daughter, Simonne-Jacqueline Cortés. Cortés was wounded on November 22, 1917, and was appointed a General Staff officer for the remainder of his time in the service. Nonetheless, he was stationed in the Champagne-Ardennes region from August to November 1918 just after the Second Battle of the Marne (July 15-19, 1918) as part of the “liberation army” routing out the last of the Germans and attempting to begin the reconstruction of the devastated area. In the midst of this unimaginable destruction, Fernande died on October 21, entrusting two-year-old Jacqueline to the care of her sister. Cortés was not demobilized until 1919 when he returned home to 15 rue Mélingue in the Buttes Chaumont neighborhood of Paris. The next year or two must have been a time of significant adjustment. It certainly was a time of change for Cortès in both his personal life and his career. In the spring of 1919, he participated in a special exhibition sponsored jointly by the Sociéte des Artists Français and the Sociéte National des Beaux-Arts to aid in war repairs. Cortès exhibited several paintings and pastels based on his military sketches. The following year, he presented only one gouache at the annual Salon of the Société des Artists Français, and it was the last time that he exhibited there. In his personal life, Cortès married his sister-in-law, Lucienne Joyeuse, on September 29, 1919, and moved back to the artist’s home in Lagny that he had purchased a decade earlier. There is a series of gouaches from this period showing a springtime landscape with details of flowering shrubs, wisteria vines and a modest watering can beside a white rose. After the images of destruction and ruin from 1919, the artist seems to have found a sense of comfort in his own home. Likewise, the images from the summer of 1920 in Brittany and Normandy, mostly gouaches, focus not on the drama of the Breton landscape, but on the quiet of an ancient shrine or sunlight on the hills near the sea. Cortès also found a new market for his art in the modern post-war world. In 1921, he sold 82 paintings to art dealers and discovered that his work was widely appreciated abroad. 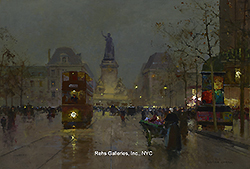 He began to create a slightly different strategy for promoting it: exhibit at two or three of the big Paris exhibitions early in the year; participate in several regional salons in France; and develop the impressively growing American art market through selected dealers. The year 1922 illustrates this clearly: he participated in the Winter Salon at the Grand Palais, and the Société des Artists Indépendants Salon and at the Ecole Français Salon in Paris. Then he turned to several regional salons in Aube, Dijon and Bordeaux. During the summer, he and Lucienne traveled to Brittany and Normandy, where Cortès could paint and simultaneously visit his sister and her family. The year ended on a sad note with the death of the artist’s mother, Léontine Cortès, on December 11 at age seventy. The next several years followed this pattern consistently. Of note however, was the reinvigoration of the Union Artistique et Littéraraire du Canton de Lagny in 1926. Originally founded in 1899 when Cortès was only seventeen, he and the surviving members decided to re-establish the organization with patronage from the town council of Lagny and begin to present their own annual exhibition. They received official approval on December 10, 1926 and held their first exhibition in 1927. From this point on, the Union Artistique et Littéraraire would remain a touchstone for Cortès, a link with his hometown community of artists and a reminder of his own roots. The late 1920s brought an international client, the T. Eaton Company Limited of Toronto. Founded in 1869, Eatons was Canada’s largest department store with offices around the world and a mail order catalogue business that rivaled that of Montgomery Ward—and they were interested in commissioning paintings from Cortès. In 1928, they ordered thirty paintings to be shown in Toronto, Winnipeg and Montreal between November and December. Eatons remained a steady client until the Great Depression of the 1930s, and perhaps more importantly, it introduced Cortès to the possibilities of the North American commercial art market. The 1930s proved to be challenging for Cortès as well. 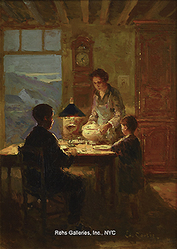 With the death of his brother-in-law, Emile Froment, in late 1928, his sister Jeanne and two of her daughters relied more often on the painter for assistance at a time when sales were less consistent. In spite of the occasional hardship, Cortès’ public reputation continued to grow, in part because of his persistence in exhibiting in Paris each year regardless of the economy. As the decade passed, he and Lucienne spent every summer with Jeanne and her daughters in Normandy, usually at Cormelles-le-Royal (Calvados) not too far from Caen. And every fall, there was an exhibition at the Union Artistique in Lagny. Perhaps the happiest event of this decade was the wedding of Cortès’ daughter Jacqueline to Georges Chevalier on February 4, 1936 in her childhood neighborhood in the 19th arrondissement of Paris. When war broke out again on September 3, 1939, Edouard and Lucienne settled in Cormelles-le-Royal with his sister. A neighboring farm family, the Oblins, supplied them with food from their gardens throughout the war. They remained there until the end of World War II, managing to sustain themselves until 1944 when the Allies mistakenly bombed Cormelles and destroyed Cortès’ studio. In the final months of the war, the Oblin’s farm was also bombed, leaving both families without a reliable food source. The Oblins moved into the Froment-Cortès home at that point, managing their meager joint resources until the Germans surrendered on May 7, 1945. Throughout the war years, Cortès persevered in sending his paintings to the annual Paris exhibitions and to a museum show in Caen. He also made contact with an art dealer named Herbert Arnot during these years and began a long-term business relationship. Arnot came from a Viennese family who had been working as art dealers since 1863, but he had opened a gallery in New York in the early 1940s; Cortès’ painting were first displayed there in 1946. [vii] For the next few decades, Arnot was an enthusiastic supporter of Cortès’ work and an important promoter of his paintings to both commercial and private clients throughout the United States. 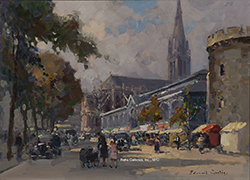 Gradually, Cortès was able to replenish his bank account and ultimately, to create a flourishing post-war career largely because of the popularity of his Parisian streetscapes with North American art collectors. In 1954, Cortès’ sister Jeanne died in Indre et Loire and he and Lucienne moved back to Lagny for good. The Union Artistique celebrated its 25th annual exhibition in 1955. That same year, the painter began working regularly with R. Stanley Johnson, an art dealer located at 645 North Michigan Avenue in Chicago. 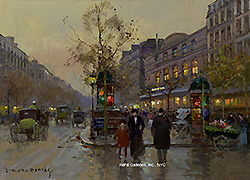 Cortès’ work had been routinely covered by Chicago media at least as far back as 1923 when the Chicago Tribune mentioned his six paintings in a review of the Salon d’hiver in Paris. 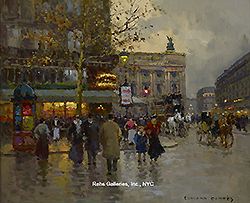 [viii] A few years later, the Findlay Galleries in Chicago included Cortès paintings in an exhibition titled French Impressionism and Post-Impressionism; and then in a solo show of his work in their Palm Beach, Florida gallery. Arnot was similarly still actively marketing Cortès’ paintings throughout North America. In spite of his advancing years, Cortès painted throughout the 1960s, sending two paintings to the Union Artistique 27th annual exhibition in 1966. However, Lucienne’s health was declining and Jacqueline moved her family to be closer to her parents. On November 13, 1967, Lucienne died at age seventy-seven. 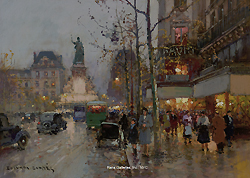 Cortès continued to paint until November 26, 1969 when he died at age eighty-eight. [i] Nicole Verdier, Edouard Cortès, Catalogue raisonné de l’oeuvre peint, Vol. 1 (Paris: Contexte, 2002) 19. Originally published in Manuel Ossorio y Bernand, Galeria biografica de artistas expanoles del siglo XIX, 1883-84. [ii] André Cortès exhibited at the Salon in 1886, 1888, 1890, 1891 and 1894. See Verdier, Edouard Cortès, Vol. 1, 35-43. [iii] Le Figaro, 26 Avril 1899. Reprinted in Verdier, Vol. 1, 47. [iv] Le Matin, 1 May 1899. Reprinted in Verdier, Vol. 1, 47. [v] “A Clever Boy Artist” The Sketch, no. 334, Vol. XXVI: 369. [vi] Verdier, Vol. 1, 71. [vii] Verdier, Edouard Cortès, Vol. 2, 15. [viii] Verdier, Edouard Cortès, Vol. 1, 81.